37 CFR 1.510(a) requires the payment of the fee specified in 37 CFR 1.20(c)(1) for a request for reexamination filed under 35 U.S.C. 302. See MPEP § 2215. If a request filed under 35 U.S.C. 302 by the patent owner includes a proposed amendment in accordance with 37 CFR 1.530, excess claims fees under 37 CFR 1.20(c)(3) and (c)(4) may also apply; see MPEP § 2250.03. This statement should clearly point out what the requester considers to be the substantial new question of patentability which would warrant a reexamination. The cited prior art should be listed on a form PTO/SB/08A or 08B, or PTO/SB/42 (or on a form having a format equivalent to one of these forms) by the requester. See also MPEP § 2217. A request for reexamination must assert a substantial new question of patentability. For each identified substantial new question of patentability and each identified proposed ground of rejection, the request must explain how the cited documents identified for that substantial new question of patentability/proposed ground of rejection raise a substantial new question of patentability. See MPEP § 2216. A requester must not, in a request for reexamination, argue that the submitted references do not raise a substantial new question of patentability, and that no order for reexamination should be issued. The request must identify each substantial new question of patentability raised and proposed ground of rejection separately. The request must apply all of the cited prior art to the claims for which reexamination is requested. For each identified substantial new question of patentability and each identified proposed ground of rejection, the request must explain how the cited documents identified for that substantial new question of patentability/proposed ground of rejection are applied to meet or teach the patent claim limitations to thus establish the identified substantial new question of patentability or proposed ground of rejection. See MPEP § 2217. If the request is filed by the patent owner, the patent owner may also indicate how the claims distinguish from the cited prior art patents and printed publications. If any statement of the patent owner submitted pursuant to 37 CFR 1.501(a)(2) is relied upon in the detailed explanation, requester must explain how that statement is being used to determine the proper meaning of a patent claim in connection with prior art applied to that claim. 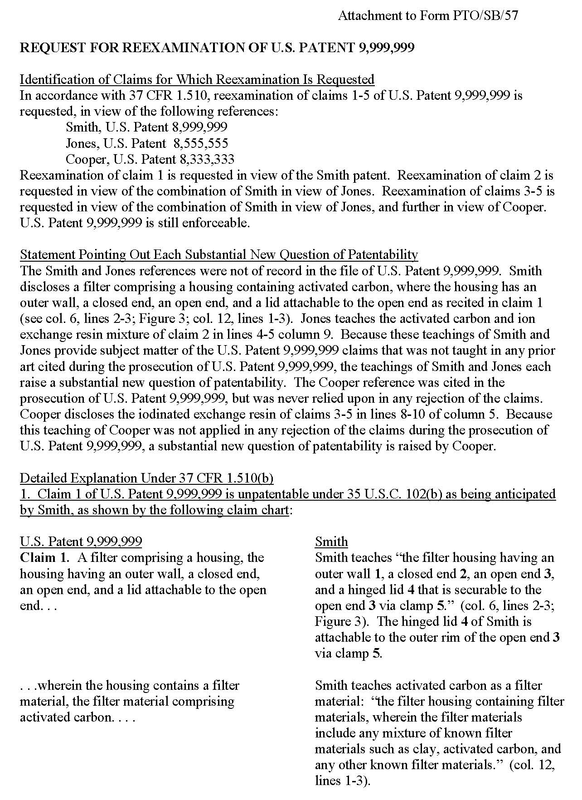 37 CFR 1.510(b)(2) requires that the “detailed explanation” of applying prior art provided in the request for ex parte reexamination must explain how each patent owner claim scope statement is being used to determine the proper meaning of each patent claim in connection with the prior art applied to that claim. The explanation will be considered by the Office during the examination stage, if reexamination is ordered. At the order stage, the Office will not consider any patent owner claim scope statement discussed in the detailed explanation of the request. See 35 U.S.C. 301(d). A copy of each cited patent or printed publication, as well as a translation of each non-English document (or a translation of at least the portion(s) relied upon) is required so that all materials will be available to the examiner for full consideration. A listing of the patents and printed publications as provided for in 37 CFR 1.98 must also be provided. A comprehensive listing is required, since the identification of the cited art in reexamination by the requester is no less important than that of a patent owner or applicant, and furthers the statutory mandate of 35 U.S.C. 305 that reexamination proceedings must be “conducted with special dispatch within the Office.” The requirement for the submission of a copy of every patent or printed publication relied upon or referred to in the request, pursuant to 37 CFR 1.510(b)(3), is waived to the extent that copies of U.S. patents and U.S. patent application publications which are relied upon or referred to in the request are not required to be submitted with the request, unless specifically required by the Office. See MPEP § 2218. 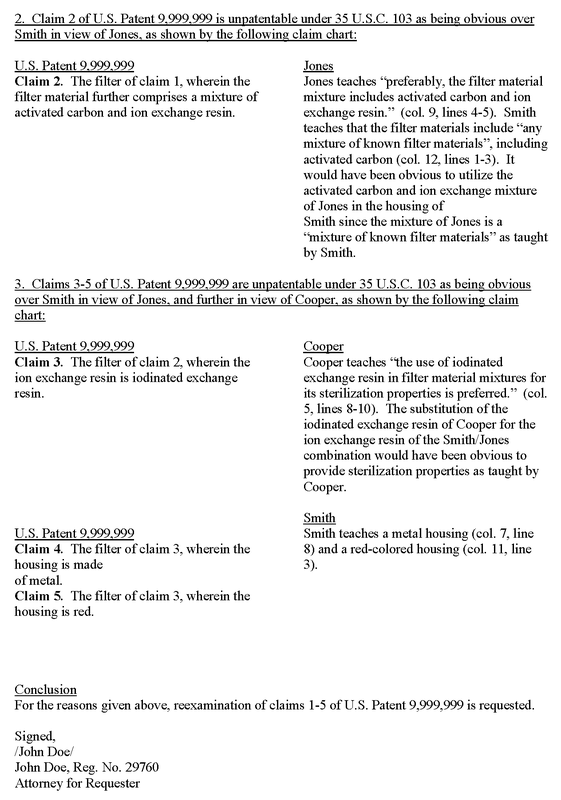 A copy of the patent, for which reexamination is requested, should be provided with the specification and claims submitted in a double column format. The drawing pages of the printed patent are presented as they appear in the printed patent; the same is true for the front page of the patent. Thus, a full copy of the printed patent (including the front page) can be used to provide the abstract, drawings, specification, and claims of the patent for the reexamination request. The printed patent is to be reproduced on only one side of the paper; a two sided copy of the patent is not proper. See MPEP § 2219. Any disclaimer, certificate of correction, or reexamination certificate issued in the patent becomes a part of the patent. Thus, a copy of each must be supplied in order to provide the complete patent. The copy must have each page plainly written on only one side of a sheet of paper. If the request is filed under 35 U.S.C. 302 by a person other than the patent owner, a certification that a copy of the request papers has been served on the patent owner must be included. The certification must set forth the name and address employed in serving the patent owner. If service was not possible after a reasonable effort to do so, a duplicate copy of the request must be supplied to the Office together with a cover letter including an explanation of what effort was made to effect service, and why that effort was not successful. 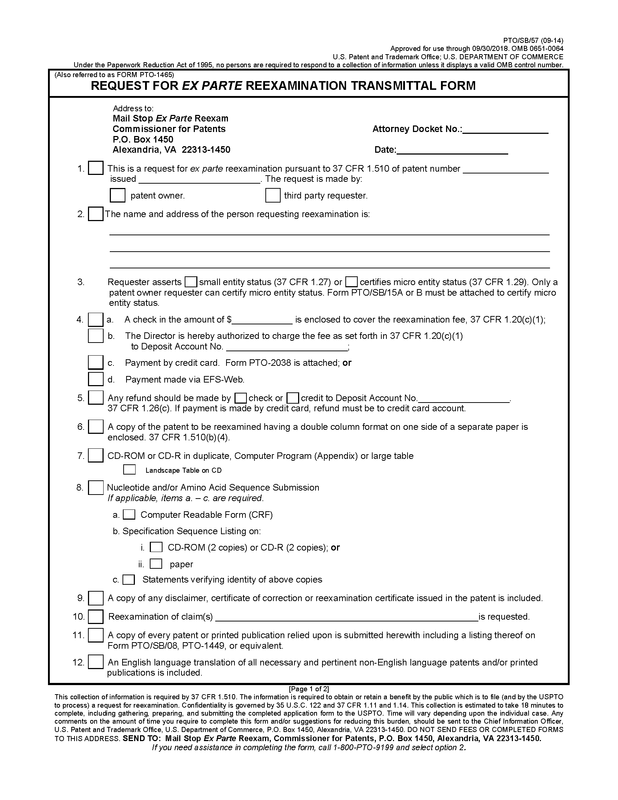 To avoid the possibility of the Office erroneously charging a duplicate filing fee, requesters are strongly encouraged to clearly word the cover letter by stating, for example, in bold print in the heading “Duplicate Copy of Request Filed under 37 CFR1.510(b)(5)When Service on the Patent Owner Was Not Possible.” The request should be as complete as possible, since there is no guarantee that the examiner will consider other prior art when making the decision on the request. Also, this may be the third party requester’s only opportunity to participate in the proceeding since, if no statement under 37 CFR 1.530(b) is filed by the patent owner, no later reply under 37 CFR 1.535 or other submission may be filed by the requester in the ex parte reexamination proceeding. See also MPEP § 2220. 37 CFR 1.510(b)(6) requires that the request contain a certification by the third party requester that the statutory estoppel provisions of inter partes review and post grant review do not bar the third party from requesting ex parte reexamination under 35 U.S.C. 302. The basis for this requirement is the estoppel provisions of inter partes review and post grant review provided in AIA 35 U.S.C. 315(e)(1) and 35 U.S.C. 325(e)(1), respectively, which identify when a petitioner for inter partes review or post grant review, or a real party in interest or privy of the petitioner, may not file a request for ex parte reexamination. The rules do not require ex parte reexamination requesters to identify themselves upon the filing of the request under 35 U.S.C. 302. The certification requirement of 37 CFR 1.510(b)(6), coupled with a party’s 37 CFR 11.18 certification obligations when transacting business before the Office, are considered sufficient to ensure compliance with the inter partes review and post grant statutory estoppel requirements. A real party in interest that wishes to remain anonymous when filing a request for reexamination under 37 CFR 1.510 can do so by utilizing the services of a registered practitioner. In such an instance, the registered practitioner submitting a request for reexamination on behalf of the real party in interest would be certifying that the real party in interest was not estopped from filing the request. Conversely, an individual filing a request for reexamination under 37 CFR 1.510 on behalf of the individual cannot remain anonymous, as the individual is required to sign the document that includes the 37 CFR 1.510(b)(6) certification. In order to obtain a reexamination filing date, the request papers must include the fee for requesting ex parte reexamination required by 37 CFR 1.510(a) and all of the parts required by 37 CFR 1.510(b). Request papers that fail to satisfy all the requirements of 37 CFR 1.510(a) and (b) are incomplete and will not be granted a filing date. See MPEP § 2227. An application data sheet (ADS) under 37 CFR 1.76 cannot be submitted in a reexamination proceeding except as provided in MPEP § 2258.02. Form PTO/SB/57 should be helpful to persons filing requests for reexamination under 37 CFR 1.510. 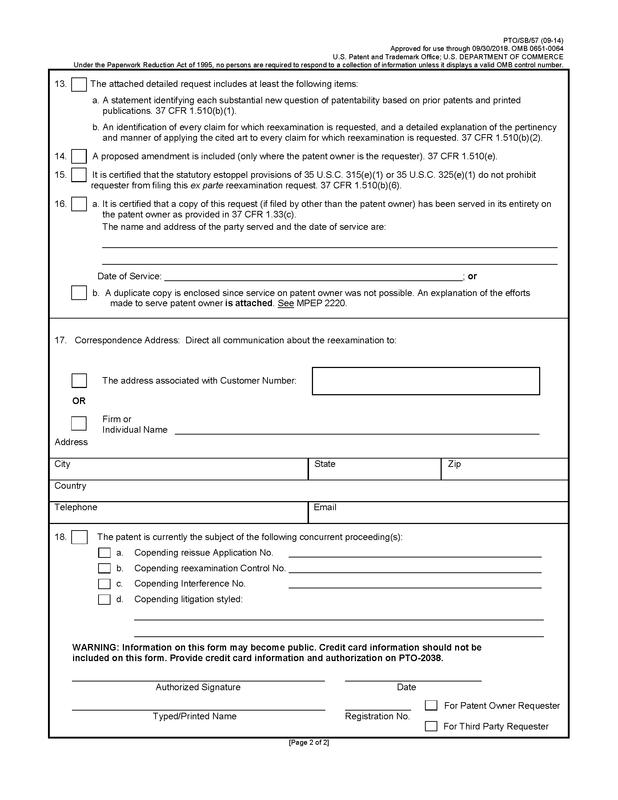 The use of this form as the transmittal form and cover sheet of a request for reexamination is encouraged, but its use is not a requirement of the law nor the rules. Immediately following is a form PTO/SB/57 and a sample of a request for reexamination that would be attached to the form PTO/SB/57 cover sheet.